One year before Vacheron Constantin, the world’s oldest uninterrupted manufacture, celebrated its 250th anniversary in 2005, it erupted with yet another milestone – one that deserved to be celebrated almost as lavishly. Foreshadowing the big anniversary, Vacheron Constantin re-launched its luxury sports watch, the Overseas, in 2004 with the weight of history providing the just right context for the introduction of what would become a new classic among casual wristwatches. But before I recount that story, let’s go back a little more in time to find out why that re-launch took place at all. In 1977, on the occasion of its 222nd anniversary, Vacheron Constantin created a watch aptly named the 222. Following Audemars Piguet’s Royal Oak (1972) and Patek Philippe’s Nautilus (1976), the 222 represented the last of the “big three” models meeting the then modern client’s demand for casual luxury. The 222 was produced in 34 and 37 mm case sizes in stainless steel, gold, and two-tone steel and gold. Unlike the sportier watches made by Patek Philippe and Audemars Piguet, both of which were designed by Gérald Genta, the 222’s design emerged from the drawing board of Jorg Hysek. As Vacheron Constantin was (and remains) a brand known for its elegant design, its clients were more than a bit surprised by the 222’s sheer masculinity: its notched bezel looked like part of a mechanism; a Maltese cross emblem was engraved directly on the lower right corner of the 70s-style case; and an integrated metal bracelet completed the sporty new look. The 222 was powered by automatic Caliber 1121, a movement based on a development by Jaeger-LeCoultre specifically for Vacheron Constantin and Audemars Piguet, all three of which have enjoyed an intimate shared history. While Jaeger-LeCoultre never used this movement (called Caliber JLC 920 in its home factory) in any of its own watches, Caliber 1121 also powered Patek Philippe’s Nautilus (as Caliber 28-255), meaning that it was the movement for all three of these 1970s luxury sports watches – and continued to be that until the mid-1980s. Produced until 1985, the 222 was the chief inspiration for the Overseas, which was introduced 11 years later in 1996. The first generation of Vacheron Constantin’s stainless steel luxury sports watches was introduced in 1996, with the line’s first chronograph making an overdue appearance in 1999. The design team for the first Overseas model comprised independent designer Dino Modolo (for more of his work, see Get Ready For Amazing: Corum’s Golden Bridge Ronde) and Vincent Kaufmann of Vacheron Constantin, who today heads the brand’s entire design department, which was officially founded in 2001. The first Overseas model, arriving in a classically sized 37 mm case, was powered by Caliber 1310, which was based on Girard-Perregaux Caliber 3100. Two more sizes – 35 mm and 24 mm – were subsequently offered. The chronograph of 1999 was powered by the Frédéric Piguet-based automatic Caliber 1137. Vacheron Constantin decided to launch a new, improved, and above all larger Overseas in the noughties to cater to the rising demand for bulkier watches. 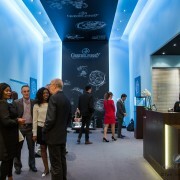 Christian Selmoni, now product marketing and product development director at Vacheron Constantin, was part of the team in charge of the key re-launch. Naturally, the most obvious changes were visual. The masculine dimensions of the 42.5 mm chronograph case remained simultaneously angular and beguilingly soft in stainless steel thanks to the interplay of the brushed case and the satin-finished bezel purposefully reminiscent of the shape of Vacheron Constantin’s hallmark Maltese cross. Doing away with the obvious crown and button protection streamlined the look of the right flank as did lessening the curvature of the case, making it more pronouncedly masculine in appearance. The crown remained screw-locked for 150 meters of water resistance. One of the most stunning outward differences was the new bracelet, however, which suggested more motion as well as a large amount of attention paid to it by its designers. The broad links were shaped like half Maltese crosses, continuing in the central design theme of the timepiece. Perhaps the most obvious new feature of the 2004 Overseas, though, was its updated dial. The chronograph was face-lifted with a stamped guilloché pattern in either galvanized black or silver-plating and graced with 18-karat gold hour markers and hands inlaid with lume. The chronograph also featured a strikingly large date display – a crowd favorite unlike the uneven chronograph totalizers – while the magnified date on the automatic three-hand watch was coolly inserted at 4:30. Hidden underneath the new dials was also another new feature: a soft-iron non-magnetic cage under the dial that surrounding the movement, which provided added protection against potential electro-magnetic disturbances to the watch’s rate. Parallel to the two masculine models in stainless steel, Vacheron Constantin also launched a female Overseas in a 34 mm version. Its dial was available in a silver-plated guilloché pattern with eight 18-karat white gold markers and four Arabic numerals or in natural mother-of-pearl with twelve brilliant-cut diamond hour markers (0.144 ct). As a tribute to the feminine predilection for sparkling aesthetics, the irregular shape of the Overseas bezel secured to the case with eight hidden screws was also available set with 94 diamonds (0.53 ct). Though they were not visible through the specially engraved Overseas case backs, the finely finished movements powering these models were based on movements of reputable reliability and prestige. Caliber 1137 continued to power the chronograph, an aesthetic mechanism based on Frédéric Piguet’s classic 1185 caliber. The men’s three-hand watch with date was powered by Caliber 1126, based on a Jaeger-LeCoultre movement, Vacheron Constantin thus forgoing the previous alliance with Girard-Perregaux in favor of its new Richemont sibling. At the 2016 SIHH, Vacheron Constantin rolled out its refresh of the whole Overseas collection. I reviewed the new models – a time-only version, a chronograph, a “small model,” an ultra-thin perpetual calendar, and an ultra-thin model – in The New Vacheron Constantin Overseas Reflects Travel, Companionship, And Extremely Easy Strap Interchangeability. If you read or re-read this review, you’ll see I was enthusiastic about the model refresh – and with good reason. This really good casual chic timepiece was made even better with the addition of not only in-house movements, but also the intelligent strap-change system and – very importantly – the reworked bracelet. “We tried to simplify and balance the design, getting back to the feel of the 222,” Selmoni explained the starting point. Vacheron Constantin added a delicious worldtimer to the lineup in the spring of 2016, and in honor of it the brand invited a few journalists to spend a couple of days wearing the watches during a short trip as well as to spend time with Selmoni to learn more about the design process. So on the twentieth anniversary of the Overseas collection, the brand finally reached its goal of 100 percent in-house mechanical movements – all of which are certified by the Seal of Geneva. What Selmoni meant with this is that the brand’s design team has incorporated codes and finishes in the sporty casual Overseas that are normally associated with dress watches. This includes shiny dials and finishes that are usually found on more elegant timepieces. “We did want to create that tension between sports casual and elegant, which is a challenge,” the designer smiled. The dials now exude maximum contrast with matte and shiny interplay, which is usually not something found on a sporty watch. The dials even boast a new font adapted for the Overseas derived from an existing one in use at Vacheron Constantin. The three-part case design is not only dynamic, it also allows the use of other materials to perhaps enter the mix in future evolutions. The previous bracelet was simpler in it geometry, while the Overseas III bracelet is much more sophisticated with its various levels, polishes, and finishes. And not to forget the genius way that it reveals its Maltese cross design; the Maltese cross is Vacheron Constantin’s emblem. Currently, the Overseas comes in three dial colors and Selmoni assured me that more colors are on the way. The worldtimer is one of Vacheron Constantin’s most famous complications: the traditional Genevan marque introduced its first world time wristwatch in 1932 according to a patent by Genevan watchmaker Louis Cottier – who, coincidentally, also worked with Patek Philippe – which utilized the standard 24 time zones according to the 1884 International Meridian Conference as its base. At the 2011 SIHH, Vacheron Constantin made a distinctive mark in world timing by introducing the Patrimony Traditionnelle World Time with 37 time zones. Its display was made up of three superimposed dial parts: a sapphire crystal dial with day/night shading and 24-hour display for easy reading of home time; a metal dial with a “Lambert” projection map that allows all 37 time zones to be seen at a glance, including Daylight Savings Time and reference city indication; the third, outer part is a metal chapter ring for the local time (main hands), which stays fairly unobtrusive. This complicated system stays incredibly clean and fairly legible, therefore representing a real milestone for providing globally related timing information. And now it is available in the Overseas collection – a great addition! Though the case of the worldtimer is larger than the other Overseas cases at 43.5 mm in diameter (versus 42.5 mm for the chronograph, for example, the next largest member of this line), it remains quite wearable even for small wrists thanks to its lower height (12.6 mm versus the 13.7 mm of the chronograph) and extremely good design allowing it to hug the wrist. I know that the dials of worldtimers can often look confusing, but I truly think that this dial is the least confusing version I have seen. And one of the most stunning from an aesthetic point of view. It is available in blue tones and brown/grey tones. The spirit of the new Overseas is perhaps best understood from the rotor gracing its new automatic movements: the design of it was inspired by a windrose, symbolizing the spirit of travel. Apparently, it will guide you anywhere. For more information, please visit www.vacheron-constantin.com/en/watches/overseas.html. I really wish they had kept the big date om the chrono version, I really thought it was good look. The best overseas was the generation 1 chronograph on a black dial with Arabic numerals. Was underrated when launched but they got the look spot on with a smaller case & big date. The VC OS II Chrono has one of the best designs and strikes a perfect balance between rugged sports and elegant luxury. The different sized subdials is a unique design element that is ahead of its time. And finally, the big date complication just seals the deal. As for the VC OS III, I like the innovative strap change features but I don’t find that value proposition compelling. I love the in-house movement but seriously, the F Piguet is one heck of an elegant chronograph movement. You cannot fault it because the holy trinity have all used it at some stage of producing chronographs. In-house or outsourced movements does not bother me and isn’t a deal breaker. Finally, my disappointment in the latest VC OS range is the elimination of the big date, apart from over doing the chapter rings in the dial and seriously, the case is a little bit ‘too’ refined for a sports watch. Once again, removing the Vespucci engraving to reveal the in house movement….not sure about that. Alas, Geneva Seal sounds good, but that does not motivate me and has never motivated me to purchase a Roger Dubuis or a Nautilus for reasons I shall not write here. In summary, would I pay USD37k for a luxury sports chrono that’s just over done in the refinement department? Hmmm….